The list of accepted projects includes several papers, presentations, round tables, panels, and posters. “ILA is the largest and most prominent conference of its caliber and provides outstanding visibility for our academics in this genre,” said Dr. Bean. “We are very proud of each scholar, those who submitted independently, those who worked on teams, and those who collaborated with other schools.” Once again University of Phoenix has shown its rigorous ability to conduct and disseminate scholarship in a space that has been dominated by traditional schools for years. “The creativity of our scholars and the connectivity to the literature cannot be over emphasized,” Dr. Bean added. Among the first in this impressive scholarly lineup includes School of Advanced Studies (SAS) Lead Chair Kevin Bottomley who will present, Leadership skills for millennials: challenging the status quo. Dr. Bottomley is no stranger to ILA. Not only has he presented on behalf of SAS at this annual conference, but co-authored the chapter Crafting community and change through books and pads: The Tikondwe teachers project to Domasi, Malawi in the new 2017 ILA book Grassroots Leadership and the Arts for Social Change by Emerald Publishing. Several others will be making their ILA debut including recent SAS grad, Dr. Jim Turner. Turner, a career military veteran, is preparing a poster based on his dissertation entitled Servant military leadership can be most effective during unstable times. Turner maintains that personnel who work their way up are better suited for future roles as well as overall retention. Rita Carver, SAS chair will join him during the poster session with her project, Turbulent times -- A clarion call for leadership: Four African American women who responded. Representatives from ground campuses include Dr. Renee Green, business chair, Hawaii Campus who will be presenting Millennials and followership – Creating a DIGITAL connection and Dr. Janice Cardwell, Detroit campus director, presenting Harnessing potential in turbulent times by forming a community of scholars, along with Bonnie Eliis, V.P. academic affairs, and Yvonne Phelps, regional V.P. Finally, from Detroit, Veteran Associate Faculty, Katherine Temple also will present From despair to hope: Prophetic leadership in turbulent times. Senior Research Fellow, Women and Leadership Research Group, Dr. Lynne Devnew will be aboard a panel discussion entitled, Using intergenerational narratives and the medicine wheel to describe women's leader development, a collaborative effort with Lead Ann Berghout Austin, Utah State University, Marlene Janzen Le Ber, Brescia University College, Judith LaValley, Kansas State, and Chanda Elbert, Texas A&M. Lynne also will be presenting Developing a woman’s leader identity and leadership aspirations: Reflections of a pioneer. This presentation is part of a study she is doing for a Bentley seminar. Dr. Devnew and her team are also to be congratulated for being accepted to present at their fourth ILA global conference (San Diego at a pre-conference, Barcelona, Atlanta, and Brussels). They are also presenting June 11-14 at their second Women and Leadership Affinity Group conference, Advancing Women in Leadership: Cultivating Our Whole Selves. There will be 11 UOPX scholars at this conference in Rhinebeck, New York. UOPX is a major sponsor. 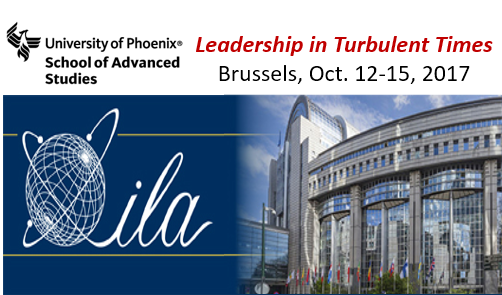 Sandra Nunn, Lunthita Duthely, & John Avella, Overcoming turbulent times through ethical leadership: A global perspective. Dr. Nunn also is a research fellow at the Center for Educational and Instructional Technology and is a national security and leadership expert. Dr. Bean, who has attended and presented at other ILA conferences has two presentations lined up with Jeofrey Bean, University of California Extension, San Diego. The brothers will present Navigating the successful use of personas in turbulent times and Starbucks social media and business leadership renewal during challenging times. Finally, Dr. Mark McCaslin, dean of research & scholarship will be presenting, The Journal of Leadership Studies: Publishing cross/inter/multi/trans-disciplinary leadership research. “I can’t think of a better venue to showcase the many talented scholars we have,” said Dr. Bean.